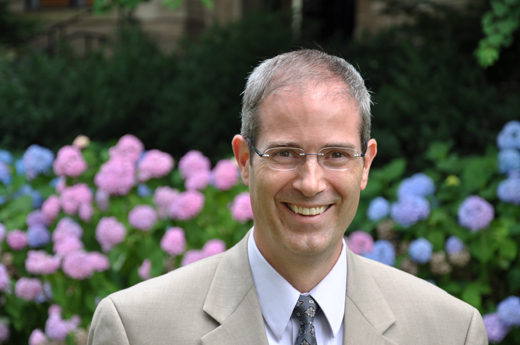 Christopher Long, author and associate dean in the College of the Liberal Arts at Penn State, will speak about digital publishing in the academic world on Sept. 25. Photo courtesy of Christopher Long. The new Emory Center for Digital Scholarship (ECDS) will host a lecture on academic digital publishing by Christopher P. Long, author and scholar at Pennsylvania State University, from 3-4 p.m. on Wednesday, Sept. 25, in the Jones Room of the Robert W. Woodruff Library. In his lecture, titled "E-book as Ecosystem of Digital Scholarship," Long will discuss his experiences creating the forthcoming enhanced e-book "Socratic and Platonic Political Philosophy: Practicing the Politics of Reading" (Cambridge University Press). He is a philosophy professor and associate dean for graduate and undergraduate education in the College of the Liberal Arts at Penn State. Long's interactive e-book uses digital media technology to demonstrate the practice of collaborative reading for which it argues. For example, the text will have the audio of 11 conversations embedded in it, enabling readers to listen to these dialogues as they encounter them. To cultivate a community of collaborate reading, the e-book will enable readers to make their highlighting and annotations public. In addition to his forthcoming e-book, Long hosts an academic podcast, and he's about to launch an online philosophy journal, says Stewart Varner, ECDS digital scholarship coordinator. "He has a lot of firsthand experience with digital publishing. Emory supports many digital publishing projects and, as such work becomes more common, we will need to be ready with robust processes and strategies," Varner says. "I'm hoping he'll have some interesting things to consider for scholars currently doing digital publishing and scholars who want to get involved in it." The discussion will appeal to faculty, graduate students, humanities researchers, and anyone who wants to see their research online, Varner says. Varner hopes that Long, as a dean at Penn State, might also discuss what digital publishing means regarding tenure and promotion; some fields, particularly the humanities, have been reluctant to accept digital publishing due to a common misconception that "it isn't real or rigorous enough," Varner says. Long's presentation, open to all at no charge, is sponsored by ECDS and the Center for Faculty Development and Excellence.